The Walking Dead may have wrapped Season 8’s “All Out War,” but is the next big bad just over the horizon? Fans are whispering about a deliberate clue from Sunday’s finale, though producers now walk back any confirmation of Season 9’s next villain. 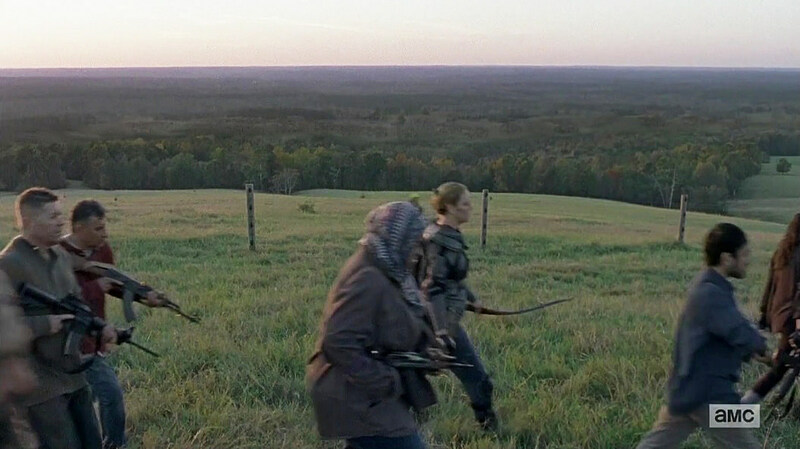 You’re warned of potential Walking Dead spoilers from here on out, but comic fans couldn’t help noticing that Sunday’s “Wrath” finale drew particular attention to a herd of walkers in the distance, both before and after wrapping up the conflict with Negan. The image largely served to illustrate a point in Rick’s speech, but some took it as deliberate foreshadowing of post-Negan comic villains “The Whisperers,” a cult-like group who travel among herds of the dead by wearing their skins. Underscoring that theory was a line of fence posts along the landscape resembling those the Whisperers use to mark territory. I would be a liar if I said those fence posts were an intentional nod. (Laughs.) It’s a location where we even talked about pulling them down. But it’s a real field with a real fence. I would love to say we’re geniuses in that regard, but it was reality that did the foreshadowing there. If it was [an intentional hint], it was subliminal. It very much had to do with the world they live in now. I think the intent with that was to show that if they continue fighting amongst themselves, there will be nothing left to survive. So it wasn’t necessarily a reference to the Whisperers. It was more a reference to that there’s still an enemy out there, and it’s a common enemy, which is the army of the undead. There’s been some question as to whether The Walking Dead will skip the Whisperers altogether, as the comic arc features Carl in a prominent role. Chandler Riggs’ exit from the series was itself a significant departure from the books, and Season 8 also waved off a comic time-jump as Carl’s vision of an idyllic future. There are also indications Season 9 might move away from established communities, and potentially use Jayne Atkinson’s mysterious “Georgie” to set up another comic arc beyond the Whisperers. We may be in for some cast turnover as well, so stay tuned for more on The Walking Dead Season 9 as production gears up over the next weeks.